The small town of Winton in outback Queensland has played a pivotal role in Australian literature and the development of an Australian legend, for it was at a cattle station named Dagworth Homestead, just to the north of the town, that A.B. “Banjo” Paterson wrote Waltzing Matilda, and it was set to music (based on a traditional tune) by Christina Macpherson in 1895. Indeed, the very plot of the song is said to have been inspired by events which took place at Dagworth Homestead during the Great Shearer’s Strike of 1891, when three policemen gave chase to a swagman named Samuel Hoffmeister, who shot and killed himself at the waterhole rather than allow himself to be arrested. It is thought that Christina and her brother Bob told Banjo Paterson the story during his stay at the station. 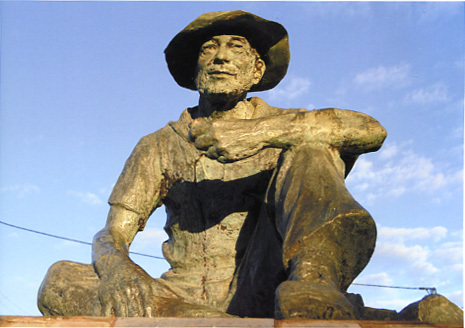 The folklore of the song and its creation is the pride of Winton, which has its own museum, the Waltzing Matilda Centre. Waltzing Matilda received its first public performance in Winton’s North Gregory Hotel, on April 6 1895, and this year, the town of Winton held its inaugural Waltzing Matilda Day on April 6, to honour and celebrate our national song. In fact, the town’s mayor, Ed Warren, has asked that Waltzing Matilda Day be declared a public holiday. A worthy notion, but even someone as keen on holidays as me cannot help noticing we already have Easter and Anzac Day that month, so April seems a little full up. The town of Winton was named by postmaster Robert Allen, supposedly after his birthplace in England, a suburb of the seaside town of Bournemouth in Dorset. The suburb is named after Winton Castle in Scotland, home to the Earl of Winton, a relative of local Dorset family, the Talbots. Winton Castle is near Edinburgh, and was originally owned by one of the oldest families in Scotland, the Setons; it was built in 1480 on lands the family had acquired in 1150. It is now an award-winning hotel and conference centre. However, as it turns out, Robert Allen was actually born in Winchester in Hampshire, which was also known as Winton. This lovely cathedral town’s name is a mixture of British-Roman and Anglo-Saxon, and means “market town”. 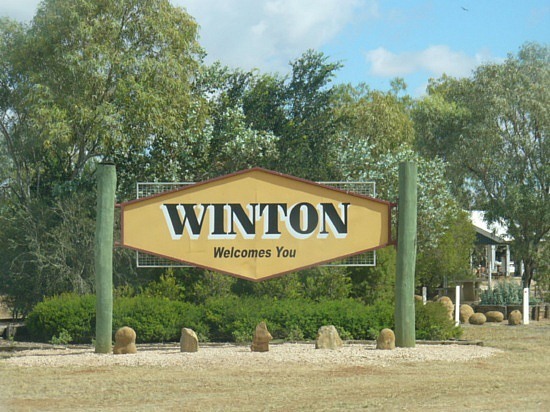 The surname Winton is famous in Australia as belonging to Western Australian novelist Tim Winton. He has won a swag of literary prizes, including the NBC Banjo Award for Cloudstreet. He has been named a Living Treasure by the National Trust, and awarded the Centenary Medal for services to literature and the community. As well as writing and winning awards, Tim also finds time to support the environmental movement. As a patron of the Australian Marine Conservation Society, he has raised awareness about sustainable seafood consumption and campaigned against shark finning; he is also patron of Stop the Toad Foundation and has contributed to The Last Whale website. He has been prominent in the campaigns to save Moreton Bay and Ningaloo Reef. Mr Winton writes novels for grown ups, and also children’s books, most notably the Lockie Leonard stories, about young surf rat Lockie who moves from the city to the coastal south-west of Western Australia (probably not coincidentally, this is exactly what Tim Winton did when he was twelve). The TV series based on the books is filmed in Albany, where Tim grew up, and has also won a stack of well-deserved awards. The English surname Winton can come from Winton in Lancashire, whose name means “willow wood farm” – a place where willow trees were farmed for their extremely useful wood. Winton in Westmoreland, however, means “Wina’s pasture”. The name Wina meant “friend” in Old English. It is from this personal name that Winton Castle in Scotland is also named, which seems to have brought us full circle. I saw the name Winton on a baby boy who competed in the Bonds Baby Search. It’s very similar to the aristocratic Winston, yet with its own connections to the world of Australian literature, the Australian coast and the Australian outback. It seems like an unusual yet stylish choice. I immediately thought of Tim Winton not that that’s a bad thing no it is a good thing he is amazing. When I saw the name on a real baby, my first thought was Tim Winton too – then all the news stories started coming in about the town Winton, and I thought, “Hang on … there’s another Australian source for the name”. Winton would make a nice name.